For Maryland Republicans, the 2010 election was a shock, especially compared to national results. Despite victories here and there, we now know our state government will lurch on to follow economic basket cases like California or New York, where free-spending Democrats believe taxpayers comprise a never-ending gravy train. The title of this piece refers to Ayn Rand’s 1957 novel, “Atlas Shrugged.” A book which doubles as a parable, its theme is how society reacts when the producers withdraw from an intrusive, overbearing government. In Maryland, this scenario played out on a small scale via the so-called “millionaire tax” in 2008 — instead of creating the extra revenue predicted, overall tax receipts fell well short of projections. Those who could afford to do so voted with their feet and left Maryland for other states that encouraged their presence by featuring low tax rates and a regulatory environment more conducive to business. For those departing, it was their manner of “going Galt,” a phrase inspired by the character in “Atlas Shrugged” who led the exodus of those tired of the overtaxation, overregulation and general disgust from those in government toward citizens successful in the private sector. With this backdrop, Free State Republicans are in the process of choosing a leader for the next four years. Given the hand with which they have to play, the next state government term will need to be spent both fighting a rear-guard action to slow down Annapolis’s march toward oblivion and educating the public as to why it’s necessary — needless to say, voters missed the GOP message prior to the election. Or did they? Maryland Republicans put up candidates who, for the most part, were tacitly endorsed by party brass. Many among them were willing accomplices to the Democrats on their destructive course over the last four years — although some would argue that ship began sailing decades ago. In either case, no course correction was made with this election. Republicans need to work on making sure voters are aware of the fix surely required four years hence. And while it may not be popular with Democrats or the media, Republicans in Maryland indeed can’t just be the party of “no” — we must be the party of “hell no.” Sometimes there can’t be a compromise made; as Rand herself pondered, what is the compromise between food and poison? We must refuse the siren song of budget “fixes” involving new and expanded taxes, and fight tooth and nail against additional regulations and misguided ideas like the “green jobs” boondoggle. Our best new chairman will be one who realizes there can be no compromise in our principles; instead, he or she will intuitively know Maryland Republicans need to present a bold palette of ideas and candidates in 2014. Our new leadership must convince our state’s producers help will eventually arrive. Give us anything less and Atlas will fail. One of the most often repeated arguments against free market capitalism is that is makes selfish, greedy monsters out of all of us. That a system based on one’s self-interest instead of the interests of the “collective” is evil on its very face. It is almost accepted as a fact that if it wasn’t for government enforcing our charity through the social safety net, poor people would starve, old people would die penniless in the streets, the infirm would be on the street corners begging for spare change and children wouldn’t be educated while a few rich individuals would spend their time rolling around in their money like Scrooge McDuck. In fact, history has demonstrated the exact opposite. The more the government exercises control over the economy and the people that make it up, the less freedom the people have and the poorer they are. In the 1920’s millions of people were dying of starvation in Communist Russia while America, experiencing a resurgence of freedom after the tyranny of Woodrow Wilson, was prospering like no other place on earth. Before we allowed the government to control the economy through the Federal Reserve and New Deal programs, we never had a recession that lasted more than a few years. Up until the Roosevelt era, the history of the United States was one of prosperity, innovation and upward mobility. Only in America could a bobbin changer or desk clerk amass some of the largest fortunes on earth within their lifetimes. It was these men, acting in their self-interest, attempting to satisfy the self-interest of consumers free from government direction, regulation, taxes and control that created the standard of living we enjoy, a standard of living that is still the envy of the world. That being the case, why is socialism selfish while a system based in individual self interest is not? The reason is that a system of socialism removes all meaningful interaction and responsibility among individuals within the society. The primary relationship in an individual’s life is with the state, not his or her neighbor or even his or her family. The government takes care of our children. With pre-K and Head Start, we place them in the care of unionized government employees from the time they are three until they are eighteen. The government is now also responsible for their higher education as well. If they choose not to try to make anything of themselves, we are not responsible for them then either. The government confiscates our money through taxes to pay for the basic sustenance of those who are either too lazy to work or have made bad choices that have placed them in poverty. When our neighbor or family member gets sick, the government will now determine their care. Once our parents get old, the government takes care of their needs and medical care until they die. Then the government confiscates their remaining wealth and sticks us with the bill for burying them. Before government stepped in, people relied on their families and neighbors for all these things. If the government is going to take care of us, what do we need family for? We have seen this play out in Europe. The socialist countries of Europe have extremely low birth rates. Why? Who needs children? They are a pain when they are young and they don’t need them when they are old so why not just remain an eternal adolescent, enjoying whatever the government lets them keep on their extended vacations and abundant weekly leisure time. Not considering the next generation, getting the goodies even at the expense of the future, living only for yourself with no regard for the needs of others is the most selfish lifestyle possible. Pure capitalism, on the other hand, encourages us to be considerate of others. In a truly free, capitalist society where government stays completely out of the economic and social spheres, confining itself to the role of protector of rights, selfishness results is very negative consequences. If one tried to live as an ‘island’, giving no thought for the needs or wishes of others, you would quickly be reduced to living in a hovel as a hunter gatherer. Why? Because you would not be able to get a job. Employment in such a society requires that your labor meet the needs of an employer who is, in turn, trying to meet the needs of his customers. If you did not care about the needs of the employer you would not have a job very long. Compare the products of communist countries with those of free ones. Workers under communism cannot be fired for lack of efficiency or quality, in free countries they can be. Continuing, if you didn’t care about your neighbors and you fell on hard times, charity would be hard to come by. If you don’t make yourself valuable to others, they find it hard to put any value on you. Consider the value free counties place on individual life as opposed to counties based on the “collective”. In a free country, any life lost is a tragedy. In a communist country, twenty million lives lost is a footnote. In a “collective”, it is the group that matters and those at the top decide what is best for the group, the individual life is only worth something if it serves the needs of the collective. In a free county, every individual is valued as an individual, every individual has rights simply because they exist as a man or woman and government’s only role is to ensure that each individual’s rights are respected by all the other individuals in a society. Finally, if you do not have children or choose to be a bad parent, there will be no one to take care of you when you’re old. The point of all these examples is to show that in a free, capitalist society it is in everyone’s self interest to be considerate of the self interest of everyone else. In a socialist society, the opposite is true. As long as the individual maintains good relations with the state, other relationships are superfluous and have little value. This does not apply simply to economics but to our societal relationships as well. For the last hundred years America has been turning its back on all the things that made us great, embracing the very philosophies that have not only demonstrated their utter failure everywhere they are tried but are the complete antithesis of the system we were founded upon. Today, with our government taking a greater role in controlling our lives and the economic and social systems we inhabit, the family is disintegrating, we have created a permanent and growing underclass, we have seen the devaluation of individual life at both ends, and a stifled economy and for all our efforts we have stuck our great-grandchildren with a bill even they will not be able to pay. So who’s selfish now? Crofton, Maryland – Brian Murphy, Republican Candidate for Governor of Maryland, today released polling data which confirmed the possibility of an upset victory in November. The poll, conducted by the polling companyTM, inc., whose CEO is nationally- regarded political analyst Kellyanne Conway, shows Maryland voters prefer not to settle for an Ehrlich-O’Malley rematch. The survey also found that voters would be very or somewhat likely to support a businessman over either Ehrlich or O’Malley, and that they would support a candidate who would pledge to not raise taxes. Both factors play well for Murphy’s candidacy, as Murphy is a businessman, and is the only candidate who has committed to balance the budget without raising taxes. Given his recent entrance into statewide politics, Murphy’s name identification unsurprisingly lagged behind Ehrlich’s and O’Malley’s (27% vs. 92% vs. 96% respectively). All three candidates enjoyed net positive favorable-to-unfavorable ratings, but Ehrlich and O’Malley under-performed their favorability ratings in their ballot tests while Murphy over-performed his. In 2006, Martin O’Malley defeated Bob Ehrlich by approximately 7 percentage points (53% to 46%), and four years earlier, Ehrlich became governor with 52% of the vote. Yet, neither O’Malley nor Ehrlich performs at or above (or within the margin of error) their past levels of victory in hypothetical ballot tests. They are both under 50%, with a comparable number of voters open to another option. In the latest poll, O’Malley and Ehrlich were in a statistical dead-heat: 44% to 43%. However, only 28% definitely will vote for incumbent Governor O’Malley and 31% were firmly committed to former Governor, an “incumbent” once removed, Ehrlich. In a match-up against Martin O’Malley, Brian Murphy trailed 44% to 25%, with 31% of voters undecided. The outcome is not surprising considering Murphy’s low name recognition. But the data show Murphy’s signed pledge to not raise taxes resonates with likely voters, a fact that would allow him to show vivid contrast in a general election against the fiscally unrestrained O’Malley. When given blind ballot tests (without the names attached), 51% of voters favored a candidate who pledges not to raise taxes over one who grew the government by 40% (19%) or who raised taxes to record levels (12%). Brian Murphy and Robert Ehrlich are running in the Republican Primary on September 14. Governor Martin O’Malley is running in the Democratic Party Primary on September 14. The winners of the respective parties’ elections will square off against each other in the November 2 General Election. Brian Murphy is a successful Maryland businessman with a B.A. in Economics from the University of Maryland and an M.B.A. from the University of Pennsylvania’s Wharton School. He is founder of the Plimhimmon Group, whose first investment, the Smith Island Baking Company, has been featured in The Washington Post, the Wharton Magazine, the Baltimore Sun, Businessweek and other publications for its principled approach to job creation in Maryland. The live telephone poll of 508 likely voters was conducted June 8-10, 2010. Respondents were selected randomly from a list of registered voters in Maryland, and were screened to ensure registration to vote in Maryland and likeliness to participate in the upcoming general election. Sampling controls were employed to ensure proportional numbers of respondents were interviewed by demographic characteristics such as race, age, gender, party registration, and geographic region, as those characteristics are reported by the latest publicly available statistics from the State of Maryland and the United States Census data. For more information on the Brian Murphy for Governor Campaign, see http://www.brianmurphy2010.com. To set up a press or media interview, contact Karla Graham at karla@brianmurphy2010.com or (410) 924-4577. SALISBURY — Mike Calpino, a Nanticoke resident who says government needs a philosophical makeover, will run against Stevie Prettyman for her Wicomico County Council seat. “We need to change the way we do government. Trying to be all things for all people is too expensive,” Calpino says. The 42-year-old has filed with the Maryland State Board of Elections as a Libertarian candidate. Calpino said the county government has grown too large under the executive form of leadership and supports keeping the revenue cap in place, switching to elected school boards and holding evening council meetings. “If we were still spending what we were in 2006, we wouldn’t be in this position,” Calpino said of Wicomico’s spending habits. Prettyman, a Republican, has held the District 2 seat since December 1998. Calpino said the tea party movement over the past year has energized him to run for the council. It also motivated him to dress up in Colonial costume and speak at tea party events. The Pennsylvania native is an amateur boat builder. He constructs small sail and power boats, and has built a 60-foot barque — a type of boat with at least three masts. Calpino home-schools his three children with his wife, Kelly, and he is also the author of the 2008 book, “Memoirs of a Former American,” a fictionalized account of what America will look like 60 years from now if the U.S. doesn’t change its course. The book was written under his pen name, Patrick Samuels. Calpino said employee pensions represent a growing cost for the county. He also suggests lowering the county’s tax rate — which he said is among the highest on the Eastern Shore for income tax, admissions and amusements, hotel and motel, impact fees and levies on manufacturing. “The more you tax people, the less economic action you’ll get,” he said. As members of Congress across the country try to distance themselves from Washington by burnishing their “outsider” credentials, Senate Majority Leader Harry Reid is doing just the opposite — he’s embracing his incumbency as he seeks re-election in Nevada. After Republicans selected Tea Party favorite Sharron Angle last week to run against Reid, the Senate’s No. 1 Democrat is trying to make the case back home that experience is good, and that his clout in the nation’s capital is what brings jobs and funding to Nevada. 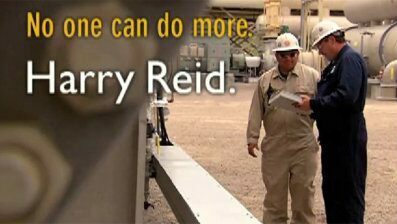 “No one can do more,” is Reid’s new campaign slogan, unveiled in a pair of ads that tout his record securing funding for alternative energy sector jobs. The strategy is undoubtedly risky in an election year when upstart candidates like Angle are surging on the crest of the Tea Party movement and incumbents are generally trying to downplay their establishment ties. While Reid, who has served in Congress since 1983, has decided to play to his decades of experience, all Republicans see is a bigger target. “It’s an interesting strategy to brag about bringing jobs to your state when you have 13.7 percent unemployment,” said Brian Walsh, spokesman for the National Republican Senatorial Committee. The nationwide unemployment rate is 9.7 percent. Walsh said he wouldn’t argue with the new slogan. “No one has done more to increase the role of the federal government or raise taxes on Nevada families,” he said. A group called American Crossroads also just released an ad billed as a response to Reid’s “no one can do more” message. “Harry Reid’s work is paying off all right — paying off for his friends in Washington but leaving Nevada with what?” the narrator says, citing the state’s high unemployment rate. The narratives are being set as the general election gets under way following a close Republican primary. Angle, a former state assemblywoman, came away the winner in that race on Tuesday after trailing her opponents for months. Reid and Democratic strategists immediately set about to casting Angle as a “wacky” fringe candidate. A Reid ad slams Angle for supporting a phasing-out of Medicare and Social Security and for pushing a drug treatment program for inmates based on Scientology. “It’s this season’s hottest new trend: Republicans nominating candidates so far to the right, they’re practically falling off the map,” Reid’s campaign said on its blog after Angle won. Reid’s campaign on Monday dismissed the GOP criticism aimed at the “no one can do more” message. Spokesman Kelly Steele said Reid has created thousands of jobs by bringing clean-energy firms to the state and secured millions of dollars to help residents stay in their homes, suggesting that’s more than Angle can say. “This is nothing more than Republicans attempting to change the subject from the dangerous, extreme agenda of their accidental candidate, Sharron Angle — who wants to eliminate Social Security and Medicare, pull the U.S. out of the U.N., give massages to prisoners, and deregulate Wall Street and the big oil companies responsible for the crisis in the Gulf. By contrast, Sen. Reid delivers meaningful results for Nevada families every day,” he said in a statement. Though Democrats claimed to be delighted at Angle’s win, a Rasmussen survey taken one day after the primary showed her leading Reid 50-39 percent. Angle, in an interview Monday with Fox News, said “mainstream Americans” are questioning Reid, and she used harsh words to assail the very record Reid is touting. She said the state’s high rate of unemployment, foreclosures and bankruptcy stand as a testament to Reid’s ineffectiveness. “Harry Reid has truly failed and we’re saying, ‘Harry Reid, you’re fired,'” she said. Angle disputed the claim that she wants to eliminate Social Security and Medicare, saying she wants to “personalize” them. Reid, his $9 million campaign war chest and his high-profile supporters see things differently. A stump speech last week by former President Bill Clinton showed that Reid’s campaign would be rejecting the argument that years in Washington make politicians go stale. “Why would you give away the Senate majority leader who has delivered time and time again?” Clinton said at the rally Thursday night. Sounding reflective as he heads into a bruising electoral season, President Barack Obama told POLITICO columnist Roger Simon that the Gulf disaster “echoes 9/11” because it will change the nation’s psyche for years to come. Historic patterns and the current political climate all but guarantee that both the House and Senate will lose Democrats in the election, and administration officials concede the Republicans have a chance of winning control of the House. Obama acknowledged that the results will help determine the course of his term’s second half. “I am spending some time thinking about 2010 because, obviously, my ability to get things done on behalf of the American people depends on a Congress that is willing to cooperate,” he said. “One of the biggest leadership challenges for me going forward is going to be to make sure that we draw the right lessons from this disaster,” he said. Hardening one of his persistent complaints throughout his presidency, Obama expressed frustration with press coverage of his administration’s response, declaring that “the media specifically is demanding things that the public aren’t demanding.” He contended that “the overwhelming majority of the American people” have reasonable expectations. Bob Ehrlich’s first priority is to strengthen Maryland’s economy and help the private sector create jobs. To reach that goal, he will treat small business owners as a source of new jobs – not a source of new tax revenue like the O’Malley Administration has the past four years. Roughly 230,000 Marylanders are currently unable to find work, and the unemployment rate in Maryland has doubled since the O’Malley Administration took office. Approximately 3,000 small businesses have closed in Maryland in the last year alone. Maryland ranks 45th out of 50 states in CNBC’s 2009 “Cost of Doing Business” ranking of the states. Bob Ehrlich believes this status quo in unacceptable. To help create jobs, he will lower the tax burden in Maryland and cut bureaucratic red tape that discourages entrepreneurs from starting new companies and hiring new employees. He believes we must get government off the backs of job-creating small business owners so they can flourish and invest in people, technology, and Maryland’s future. When Bob Ehrlich served as governor from 2003 to 2007, more than 100,000 private sector jobs were created in Maryland. Unemployment consistently remained around 4 percent, and business confidence in Maryland reached an all-time high, according to surveys. Bob Ehrlich will cut taxes in Maryland in order increase prosperity for everyday Marylanders and entrepreneurs. As governor from 2003 to 2007, Ehrlich defeated for vetoed $7.5 billion in tax hikes proposed by the Maryland General Assembly. Bob Ehrlich opposed the O’Malley’s Administration’s enactment of the largest tax increase in Maryland history in 2007. He believes it had a crippling effect on Maryland families and small business owners who were already struggling under the weight of a national recession. The O’Malley Administration enacted a record $1.4 billion tax increase, including a 20% increase in the sales tax, which disproportionately punishes low and middle income Marylanders. The O’Malley Administration also raised the corporate income tax, making it harder for small businesses to grow and create jobs. Maryland has the 4th highest combined personal income tax in the nation, according to the Tax Foundation. Bob Ehrlich firmly believes in lowering the tax burden to help Marylanders get back to work. As governor, he will repeal the O’Malley Administration’s 20 percent increase in Maryland’s sales tax, which disproportionately hurts small businesses and low and middle-income Marylanders. Bob Ehrlich believes Maryland must begin spending within its means. In the last three years, the O’Malley Administration has plunged Maryland into its largest budget deficits in history without offering any plan to balance the budget. In addition to this deficit, total state spending today is nearly $2 billion higher than it was when the O’Malley Administration took office. When the O’Malley Administration called a special legislative session in Annapolis to “reduce spending,” it actually approved $600 million in new spending just as the state was entering a recession. As governor, Bob Ehrlich will immediately cut wasteful spending and make government more responsive to the taxpayers. When he served as governor from 2003 to 2007, Ehrlich turned $4 billion in inherited budget deficits into a budget surplus and nearly tripled the State’s Rainy Day Fund. He did so without increasing sales or income taxes. Under his leadership, Maryland was one of just six states with a coveted Triple A bond rating from all three major rating agencies. Bob Ehrlich believes the environmental, cultural, and economic benefits of the Chesapeake Bay are priceless. He wants his two sons to inherit a Bay that is cleaner and healthier than the one his generation inherited, but the task will require uncommon political leadership. He is proud to have authored the landmark Chesapeake Bay Restoration Act as governor in 2004. This innovative plan financed upgrades to faulty wastewater treatment plants that emitted millions of pounds of pollution into the Bay and its tributaries every year, harming wildlife and Maryland’s watermen community. As a result of his leadership, the Bay Restoration Act is currently preventing one million pounds of pollution from entering Maryland’s waterways every year. As governor, Bob Ehrlich will continue to pursue innovative and nonpartisan solutions to restore the Bay and the wildlife that depends on it, and he has a record of delivering once-in-a-generation results for this great national treasure. Maryland is blessed to have many school districts that have performed at consistently high levels for decades. Unfortunately, those blessings are not extended to tens of thousands of students trapped in failing schools across Maryland. Bob Ehrlich believes every child in Maryland has a civil and constitutional right to a quality education. As governor, he will dramatically expand charter schools in Maryland to give children and parents stuck in failing schools a choice to move to a better and safer learning environment. Charter schools are publicly funded schools that operate with greater freedom to help students reach their full potential. As governor in 2003, Bob Ehrlich authored Maryland’s first-ever charter schools law. As a result, more than 12,000 students in Maryland are currently learning and growing in 42 charter schools across the state. He also strengthened Maryland’s needs-based college scholarship program, helping 37,000 students go to college who could not otherwise afford it.